In a previous blog post, I wrote about the realities of severe scoliosis. In that piece, I challenged the notion that surgery is the only effective treatment solution. There are, in fact, numerous options outside of surgery to treat patients with severe forms of the condition, and I think it’s important that patients and parents understand the full range of choices available to them. When it comes to mild scoliosis, the conventional wisdom tells patients and their families to watch and wait. Of course, watching and waiting typically leads to the condition progressing from mild to moderate and, eventually, to severe. I believe that patients have the best chance of treating scoliosis when it is in the earliest, mildest stages. Unfortunately, traditional treatment approaches are not so proactive. Furthermore, the signs of mild scoliosis can be quite subtle and difficult to discern. The chiropractic-centered approach to scoliosis treatment can be incredibly effective for mild cases. It can help patients reduce their curvatures and-or halt further progression. Most importantly, it can keep patients off the operating table and away from the surgeon’s blade. 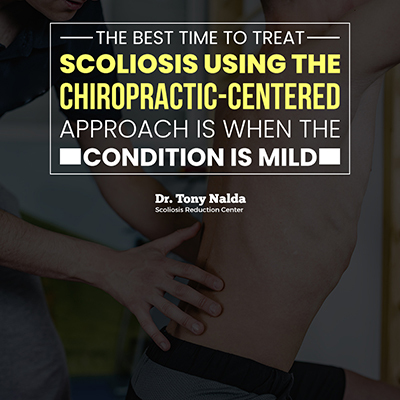 The best time to treat scoliosis using the chiropractic-centered approach is when the condition is mild. But before progress can be made, it’s important for people to be educated about the signs of mild scoliosis. Before we begin to talk about the signs of mild scoliosis, I think it’s important to understand how doctors describe the different levels of severity. Typically, a Cobb angle needs to measure greater than 10 degrees to be diagnosed as scoliosis. But traditional approaches to treatment will not recommend action until the angle reaches the “severe” classification. This is very unfortunate! There is a lot that can be done to help patients take control of their condition and avoid the progression of an abnormal spinal curvature. Truthfully, mild scoliosis is not likely to present major obstacles or limitations in terms of its impact on living an active life. But scoliosis is not a static condition; its nature is to progress and become increasingly severe over time. That is, of course, unless it is treated proactively. Are you concerned that you or your child may be living with a mild case of scoliosis? Are you unwilling to take the traditional “watch-and-wait” approach? To help you take the most proactive and helpful approach, here are the signs and factors you should look for. It’s not uncommon for adolescents to outgrow their clothes quickly. But when the fit of clothing seems uneven or reveals bodily asymmetry, it could be a sign that mild scoliosis is present. Pay attention to the way your child’s clothes hang on the body — do sleeves and cuffs appear to be uneven? Do shirt necklines seem to favor one side over the other? An uneven fit is not proof of scoliosis, but it should cause you to investigate further and determine if other factors are present. Yes, teenagers can be awkward, physically. But if an adolescent experiences issues with their balance and-or coordination to a noticeable degree, mild scoliosis may be present. You may also notice problems with proprioception, which is the sense one has of the orientation of the body in its particular environment. The way a person walks can tell you a lot about their physical condition. Often, mild scoliosis reveals itself in the way an adolescent walks. Arms may swing less, and there could be a reduction in the normal counter-rotating motion the body makes in the hips and shoulder. Basically, any indication that the body is asymmetrical could be a sign of mild scoliosis. Adolescent scoliosis patients don’t experience pain to the same degree as adults. This is because of the upward movement of their growing spines. However, if headaches, neck pain, back pain, hip pain or shoulder pain is present, it could be an indicator of a mild case of scoliosis. The likelihood of scoliosis becoming painful increases dramatically once an individual has stopped growing, which is another reason to take the signs of mild scoliosis seriously and proactively. Although scoliosis is not hereditary, family members are often exposed to the same sets of factors and environmental conditions that can contribute to its development. Therefore, a family history of scoliosis could make it more likely that your child has a mild case. These signs of mild scoliosis, by themselves, may not indicate anything more than normal changes brought on by adolescence. But if two or more of these signs are observed, it may be time to consider seeing a professional to determine if the condition is, in fact, present. Again, the sooner scoliosis is diagnosed, the sooner proactive treatment can begin. If you are concerned that your son or daughter may be living with mild scoliosis, a diagnosis marks a fork in the road on their journey through life. The medical establishment will recommend observation and inaction. But this only leads to a worsening of the condition — and to expensive, invasive surgery. Here at the Scoliosis Reduction Center, we understand the signs of mild scoliosis. Our team works with patients of all severity levels. In most cases, we are able to halt the progress of the condition completely, which allows patients to live their best possible lives. If you are concerned about your child, and you refuse to watch and wait, we can help! Call us today at 321-939-2328 to learn more.